Fungal pathogens can cause a variety of turf diseases. 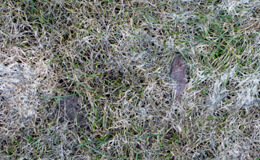 Fine-leaved grasses (such as bents and fescues) are more susceptible to lawn fungus than rye grass species. Fungi are nature’s dustmen, converting dead organic matter into basic nutrients that re-enter the food chain and are eventually recycled. The appearance of a few mushrooms or toadstools on your lawn is a healthy sign – it means that fungi in your soil are active and breaking down (for instance) an old, buried tree root. The fungi that appear on the surface contain spores which are released into the atmosphere. However, if your lawn has a heavy concentration of toadstools, a professional lawn fungus treatment programme may be necessary. Snow mould occurs during cooler times of year. Brown patches appear first, and these are followed by a fluffy white growth. Fairy rings are easily identifiable by the circle of lush green growth surrounding an area of dead brown grass. The appearance may differ somewhat depending on the type of fungus responsible for the fairy ring. 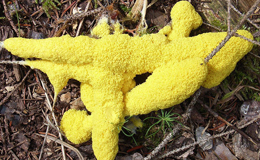 Slime moulds usually appear on dead grass. They feed on dead organic matter. Need our help to remove fungus from your lawn? Our services are available in Cardiff, Swansea, Newport and elsewhere in South Wales. 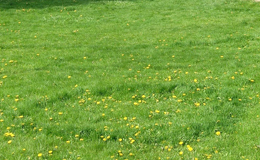 Call 0800 111 4958 now to arrange a free lawn survey.